The election may not be quite as finished as most people think. Take a look at this article about recounts and strategy. If the recount of New Hampshire turns up serious problems, there willbe demands for recounts everywhere. In addition to the recount in New Hampshire (which Kerry won), the Libertarian and Green parties would like recounts in Ohio, but requesting a recount costs about $113,600. There are two reasons for a recount. First, the exit polls, which historically have been quite accurate, differ from the tallied results by more than could be expected by chance alone. Second, there are issues about the invalidated, provisional, and absentee ballots. Once the results have been certified, which could be as early as tomorrow in some states, the paper ballots are destroyed and the computer memories are cleared immediately, preventing subsequent recounts. If you want to contribute money to the recount effort, click here for the announcement. I was unable to get through to the actual contribution site at 5 a.m. EST Sunday morning. I don't know why, but I doubt it was due to their being swamped with traffic. You might have to call the Libertarian or Green Parties if you can't get through. Unfortunately, the mainstream media don't seem to be terribly interested in getting a complete and accurate count of all the votes. Updates are in chronological order. Last update: Nov. 14, 2004. 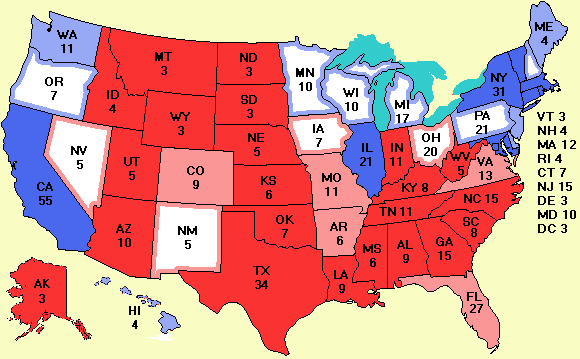 My final map based on recent averaged polls, made Nov. 2, was not that far off. It was predicting that Bush would get 278 electoral votes and Kerry would get 245 electoral votes. Their respective totals were 286 and 252. The prediction based on the historical pattern that the undecideds break 2:1 for the challenger was further off as they apparently did not do that this time. Nov. 10, 2004 Update. The site statistics are now available at www.electoral-vote.com/stats. From the logs, there were almost 5 million distinct visitors to the site from May to November and collectively they fetched 42 million pages. However, these statistics and the Webalizer statistics only count hits to the site itself. Hits from remote caches are not included and may well double these numbers. For technical reasons, there are several gaps in the data. "I am grateful to the many people who have contacted me to express their deep concern about questions of miscounting, fraud, vote suppression, and other problems on election day, especially in Florida and Ohio. Their concern reflects how much people care about the outcome of this election. I want to you to know we are not ignoring it. Election protection lawyers are still on the job in Ohio and Florida and in DC making sure all the votes are counted accurately. I have been conferring with lawyers involved and have made them aware of the information and concerns people have given me. Even if the facts don't provide a basis to change the outcome, the information will inform the continuing effort to protect the integrity of our elections. The election protection effort has been important to me personally, and I am proud of the 17,000 lawyers around the country who helped. It's obvious that we have a way to go still, but their efforts helped make a difference. Their work goes on. Nov. 13, 2004 Update. Steven F. Freeman, a researcher with a Ph.D. from M.I.T. has analyzed the exit polls and compared them to the final tallies. For those people interested in the descrepancies between the exit polls and the official results, his paper on the subject is interesting reading. Nov. 14, 2004 Update. There is a chance there may be a recount in Florida and/or Ohio due to irregularities there. Stay tuned. A spreadsheet examining how accurate the various pollsters were is now available in Excel format and in .csv format. More later or tomorrow.